I'm nothing but a Data Scientist in a company -- but at the same time I'm working as an evangelist of data science and data scientists themselves. I've been watching how people think of data scientists and how deep they are accepted in Japanese market. Compared to situation of data scientists in U.S., for example, the one in Japan looks quite puzzling and paradoxical; mass media and executives seem to accept and strongly expect and promote data scientists, although the IT industry and/or academic experts in data science fields seem to hate them. Even some of them tweet "Data scientists are just illusion" or "Data scientists must die because they are harmful for data scientific disciplines". In relation to privacy issues in big data, non-expert people now tend to think that data scientist can threaten their privacy with big data marketing, although some opinion polls show Japanese people expect "big data" to improve our daily life. A fever of data scientist has gone as a whole in Japan. Despite such a situation, a few but confident people and companies are still moving on. 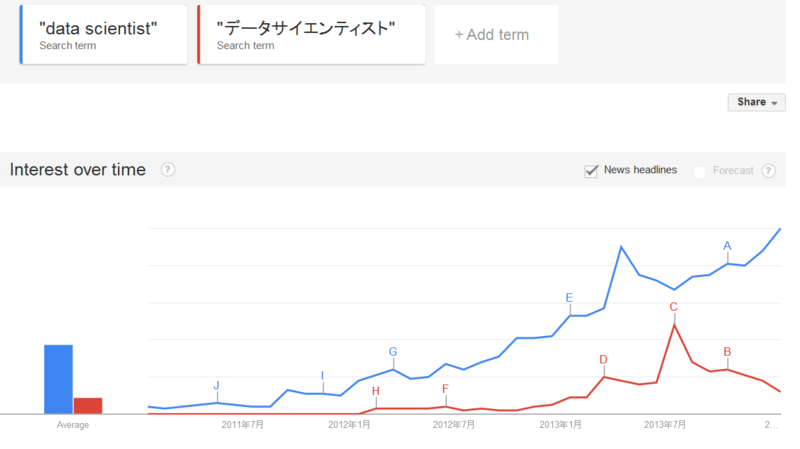 How different is the situation of data scientist between in Japanese market and in the global market? Google Trends shows it clearly. Although "data scientist" in English still rises, "データサイエンティスト" ("data scientist" in Japanese) already goes down. The fever has gone, indeed. I myself get confused with this puzzling situation, but with considering some natures of Japanese people I can understand what's going on. Below are points of my analysis. When you visit Japan, you'll see a lot of ad signs or printed matters with only emotional and/or illogical phrases, never logical description or scientific explanation. They appeal to only your feelings. This nature of Japanese people leads to some consequences: 1) A majority of executives in Japan also hate any maths, scientific or logical stuffs. 2) So many companies also disrespect experts in maths, scientific or logical disciplines, even they are unwilling to hire such people. 3) It causes that young students also don't like to learn maths and/or sciences because they know experts in such fields may be hard to get hired. At any rate, as a nature of their culture, Japanese people also don't like data sciences. This fact makes a current situation more puzzling. Despite such a nature of Japanese people, mass media in Japan are merely trend-conscious so of course they love buzzwords such as "big data" or "data scientist". Once these buzzwords were introduced to Japanese market as "the latest keywords in the global market", a lot of mass media got attracted and too many articles or stories about "What's big data?" or "What's data scientist?" were published. As a worse culture, some of executives in Japanese market love to follow them without any considering whether stuffs media reported fit their company or not. As far as I've heard, not a few companies abruptly planned to introduce "big data systems" or to hire "data scientists" after the buzzwords came. Even a few of companies used such buzzwords for advertising their products, without any real big data systems or data scientists. But experts in the IT industry or academic data science are sensitive to such a movement. First, most of academic experts bitterly criticized "big data" and "data scientists" as just "buzzwords" and "they must be harmful for sound development of academic data scientific disciplines". Almost at the same time, many IT experts also express concerns about a fever of "big data" and "data scientist", because such a fever may distort a reality of data analytics in real business. At any rate, even now only a few colleges or graduate schools provide courses for data scientist and there are few collaboration between the academics and business companies. In this sense, unlike U.S., data science and data scientist in Japanese market are not supported by the academic sector. The fact that a lot of books about "big data" or "data scientist" have been published also made the situation more complicated. Contents of most of such books were rather incorrect or distorted because they were written by non-expert writers without enough knowledge or experience in the field, while only a few nice books sold very well. Unfortunately, such books have discouraged people more and more. Now most of people in Japanese market regard "big data" or "data scientist" as fraud or not reliable. I found the trend of "big data" and "data scientist" has rapidly shrunk. You can see it in the figure above. The current situation is like pressing the gas pedal and the brakes at the same time, but the brakes work more. Interestingly even though the trend has shrunk in general, a few people and companies are still promoting the culture of big data and data scientist. They have something in common. First, they have or are facing REAL big data before the fever arose. Most of them have huge size data sets from customers, game players or registered users. Second, such companies loves innovations as their culture. Finally, they need rational and logical solutions. In Japanese market, there are only a few companies like that... the ones like Google, Facebook or Twitter are very rare. Despite the puzzling situation described above, such players and companies are still going on for the future success. I think this high contrast may increase the gap between them and a majority of Japanese market.